During a public discussion, Souleymane Fall captured his audience’s attention with his personal story of coming to America from his native Senegal 18 years ago. He related to the crowd of immigrant professionals as he shared his experiences of seeking employment while adjusting to a vastly different U.S. culture. Attendees nodded and clapped in agreement and understanding as Fall, director of employment services and workforce development for the Jewish Employment and Vocational Service (JEVS), recalled rejection from U.S. employers who did not want to hire him as a new arrival because his English was not proficient. He said American immigrants face fire from both sides of their cultural experiences - the criticism and misunderstanding of U.S. employers who do not offer opportunities to immigrants though they have qualifications from their home countries, and their dependent families, who expect immediate success and money sent home once one arrives in the U.S.
Fall was a featured speaker at the event, where immigrant professionals listened in on inspirational and informative presentations, discussing ways the City of Philadelphia - and the professionals themselves - can improve their chances to be more successful job prospects. 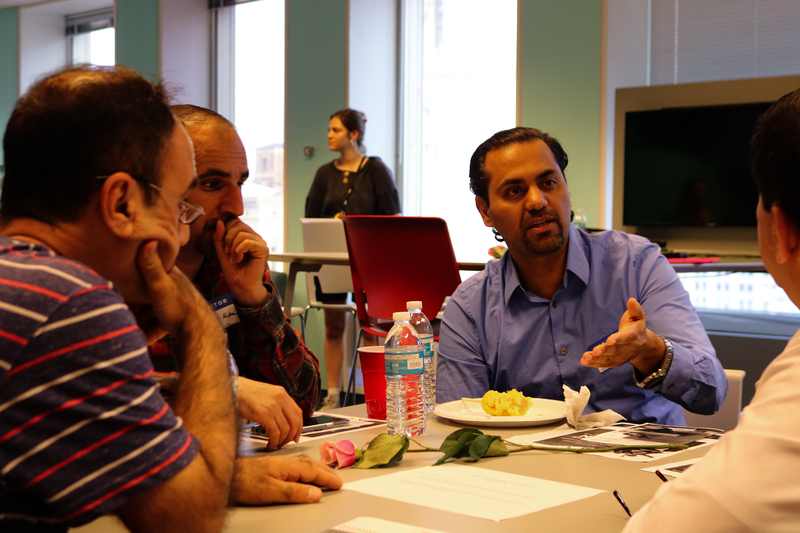 The event was held by the Immigrant Leadership Institute, a five-month training program offered by the Welcoming Center for New Pennsylvanians. According to Director of Community Engagement at the Welcoming Center Manuel Portillo, there were about 60 people registered by the start of the conversation, which was held at the Municipal Services Building in Center City. Fall and the President and CEO of the Welcoming Center Peter Gonzales noted that they had hoped to see more employers seeking immigrant talent present at the event. One goal of the conversation was to connect immigrant professionals with employers looking to diversify their workforce. One attendee also commented on how most organizations like the Welcoming Center and JVES are often restricted to support for legal immigrants, which Fall acknowledged. He also said, however, that he does whatever he can personally to help undocumented immigrants succeed too. Two other speakers who had sought the help of the Welcoming Center and Immigrant Leadership Institute also shared their stories: María, a Colombian software developer found employment in her field with the help of the program, and Erick Barragan, a Mexican lawyer who is still searching and struggling. Both spoke of the ups and downs of finding employment in the U.S. after they had held highly-qualified positions while living in their native countries. Barragan remembered being disappointed and ashamed when going through the job search process then only receiving offers for dishwashing and other low-wage positions when he had such an accomplished career in Mexico. María emphasized that English is essential, recommending the Welcoming Center’s English classes, as well as volunteering as effective ways to develop language skills. The Welcoming Center also advertised its Summer English Workshops which are held from July 7 to Sept. 21. Informational sessions for the program are being held June 27 and 28, and those interested can register here. Following the speakers, event attendees split into small groups and discussed two topic questions posed by organizers: What is one thing the City of Philadelphia can do to help immigrant professionals to be successful? And what should immigrant professionals do to be more effective in preparing for employment in the city? Immigrant professionals agreed that seeking assistance from the Welcoming Center and like-minded organizations offers a huge advantage to immigrants starting out on their employment search. A resounding message from the event’s speakers was that the connections, opportunities and resources necessary to apply one’s professional experience in their home country to their prospective American career make success more accessible.